You know, there are days when I just marvel at how much my life has been enriched by joining the world of blogging. I’m amazed at how many positive experiences this little outlet for self-expression, culinary creativity and the occasional star-struck reference to my favorite soap opera has brought my way. At the forefront, of course, is YOU–the readers and commenters. What an inspiring group of compassionate, intelligent, witty and loyal people you are! Thank you for coming back here on a regular basis; thank you for your thoughtful comments (I am, literally, thrilled every time I see one appear at the end of a blog entry–and they keep me coming back here, too); and thank you for your feedback and knowledgeable advice (I’m so excited to start cooking from my recently-acquired cookbooks, courtesy of your suggestions–yay Crescent Dragonwagon!). Truly, a blog is a sorry, desolate place without its readers. Along the way, I’ve also discovered many other blogs and bloggers, and what a revelation that has been. I was dumbfounded the other day when I realized there are now approximately 150 blogs on my Google Reader, and I seem to discover new and intriguing blogs every day (and I promise, they will all eventually make it to my blog roll). Where were all these talented writers hiding before the advent of blogs? Whether primarily for the recipes or mostly for the prose, I delight in reading every one and perk up each time Google informs me of a new post by a favorite blogger. Lately, I’ve been a bit remiss with my own comments on other blogs, but please know that I do read regularly and am enjoying all your posts! Speaking of great bloggers, yesterday I had the unique pleasure of actually meeting another Toronto-area blogger, Giz from Equal Opportunity Kitchen . As you’d expect from her posts, Giz is witty, sharp, and very, very funny. We chatted like two teenaged chums who meet up again at the 10-year high school reunion, gabbing and giggling and catching up on what we’ve been doing over the past decade. In fact, our conversation flowed so smoothly and effortlessly that we were on our way out the door of the coffee shop before we realized we hadn’t even touched on the topic we’d ostensibly met to discuss–Giz’s “slimdown challenge” to me from a while back! Thanks, Giz, for a great start to my morning! As many other bloggers have noted, blogging also forces enourages one to try out new recipes. In her recent 100th post, VeggieGirl mentioned how each blog entry represents a new recipe (can it be that the HH and I have eaten 186 new dishes–not counting all those that don’t make it to the blog–since last October??). And part of this impetus to cook novel food arrives in the form of blog events, another aspect of blogging that I thoroughly enjoy. These days, it seems there’s a new blog event posted almost daily; I sorely wish I could participate in all of them. Unfortunately, my schedule at the moment prohibits too much experimentation in the kitchen. It’s currently end of semester at the college and my marking, like all the ripe, luscious seasonal fruit, is at its peak. I’ve got a stack of papers on my desk that just might trump the CN tower as the world’s tallest freestanding structure. And while preparing foods for blog events is admittedly more colorful than marking essays (which involves only black and red, after all), it wouldn’t do to set aside the former for the latter (well, not too often, anyway). Still, when I read about the Healthy Cooking: Eat Well, Live Well event hosted by Mansi at Fun and Food, I knew I had to submit something. After all, isn’t the very raison d’être of this blog, more or less, “to create healthy, delicious foods”? (That, and to provide The Girls a forum in which to air their observations and opinions, of course). I thought about what to prepare, but my mind came up blank. Then, while attempting to clear the non-marking clutter (eg., half-filled tea mug, empty water bottle, digital camera, sticky notes with recipe ideas, cookbooks previously used for blog entries, magazines previously used for blog inspiration, my checkbook, Bram Stoker’s Dracula [the novel, not the vampire], stray Chaser hairs, my journal, an anniversary card from the HH, and my calculator) off my desk the other night, I came across June’s issue of Cooking Light. Where have I been living, under a rock or something? I mean, I’m aware there’s such as thing as zucchini bread, the moist and delectable quick loaf that’s a staple in many a baking household. I am also aware that your classic carrot cake is often studded with bits of juicy pineapple. But zucchini and pineapple? Together? It just never occurred to me. Yet there it was, staring at me from the pages of Cooking Light. The funny thing is, the magazine’s recipe was a “lightened-up” version of an older, original recipe, that contained 3 eggs, 1 cup oil, and 2 cups sugar. The Cooking Light version cut back to 2 eggs (plus an additional 1/2 cup chemicals made to taste like eggs), 2/3 cup oil and 2 cups (2 CUPS!!) white sugar. Granted, the recipe yields 2 loaves, but still–an entire cup per loaf? Seemed a bit excessive to me. And so, I decided to lighten the already-lightened version. (Is that sort of like asking Michael Jackson to bleach his skin?) Seemed to me I could accomplish a fine job of it by reducing the oil even more, and most definitely by reducing the sugar and replacing it with natural sweeteners instead. My recent avocado kick provided yet another brilliant twist. My ratiocination went something like this: zucchini is green. Avocado is green. Why not add some more green to the green, and use avocado purée instead of egg in this recipe? Along with the Omega-3’s in the flax seeds, the avocado provides a good dose of monounsaturated fats to the batter, allowing me to reduce the oil even further. 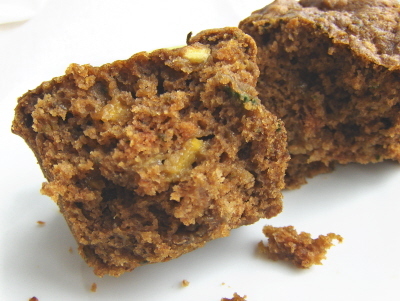 And so, my own idiosyncratic variation of zucchini-pineapple loaf was born. The bread is fragrant with cinnamon, sweet with pineapple and soft, melting bits of chopped dates throughout. The zucchini contributes a certain depth of flavor and even more moisture–in fact, this bread treads the very limits of moistness; any more moist, and it might not qualify as a solid. The flavors meld and intensify once the bread is cooled and rested, so it’s even more tasty the morning after it’s made. And like blogging, it will enrich your day with a healthy dose of sweetness and discovery. A healthy, hearty version of a heavier standard, this bread mixes up easily and is a great recipe for using up leftover zucchini, pineapple, or overripe avocado. we love you too, miss Ricki-licious. you and your recipes are what makes life worth living. for total serious, yo. I don’t think there’s much you can do to zucchini – it’s one of those “never fails”. It was fun meeting up and having coffee and completely missing the point of why we were meeting. Duh to us. Your feelings about the blogging world mimic mine as well (especially the part about being thrilled to receive new comments!). And, for me, this post ame at a perfect time, because I *just* bought a mini-loaf pan that I want to try out! These mini loaves look de-lish, Ricki! I can’t wait to put my mini loaf pans to good use. P.S. Last week I made your (I can’t remember the proper name) chocolate avocado delicious dessert and I almost fainted from how delicious it was. I served it to my sis, bro-in-law and fiance too and they couldn’t believe it was made with avocado. Truly brilliant, Ricki — brilliant! Well, I have to admit I had more fun NOT talking about dieting. . . but, I suppose, we must get back to it now! Your recipes are always so creative! I never would have thought to put zucchini, avocado, and pineapple together in anything, let alone bread. It looks delicious! I love mini loaves because you can eat 2 or 3 slices instead of one big one. Feels like I’m getting more. Yum! Mini loaves = big love!! I can only echo what you’ve so eloquently expressed, Ricki. The blogging community has brought me so much, and has allowed me to grow as a neophyte kitchen mouse. I’m always happy to see a new DDD entry in my blog reader! You inspire & delight! ehy man, thanks for your congrats about my blog and my artworks. but i wanna do compliments to you for the wonderful recipes that we daily gifts. sorry for my english, i should actually try to translate what i write on my blog in english, but isn’t easy and i haven’t so much time. creepy, kooky, spooky, ooky, manuel addams. I just got zucchini today at the farmers market! And spelt and barley flour at a natural foods store earlier this week! Are you reading my mind?! I get Cooking Light too, but I just started looking through the March issue today…whoops! I got a little behind. I should get to the June issue around October at the rate I am going :o) But like you, I use it for inspiration to create healthy vegan dishes–even if they are out of season by the time I get around to making them! Thank YOU Ricki, so much, for your wonderful blog. I look forward to reading your witty posts and trying your delicious recipes. I know how much time and effort must go into a blog, and I really appreciate all that you do! Ricki, this post is so heartwarming – I’m so glad to have “met” you in the blogging world!! :0) And those loaves look absolutely delicious. Yum! Those look wonderful. What a great idea to replace the eggs with avocado. I’ll have to keep that trick in mind. Did I somehow miss my delivery? great post Ricki! I am glad your lucky comestibles series inspired you as well as the rest of us! The idea of zucchini and pineapple has never occured to me either but sounds so delicious! I’ve always loved pineapple in carrot cake so would love this, I am sure. whole barley flour? i’d love to lay my hands on some. this sounds like a great travel snack. Buy some mini loaf tins that is! And I must say that I am loving the avocado substitution. Never, ever would have crossed my mind. Blogging, I have also found, makes me feel slightly better about my enormous (still growing) cookbook collection. 2 cups of sugar?! Yowza. But seriously, I really appreciate all your hard work, wit, and talent. You’re an amazing woman! Aw, thanks! I think creating recipes is like therapy for me. . . I just find it fun and relaxing. And I like your logic re: the mini-loaves! Thanks so much! I so enjoy reading your blog as well (and love the opportunity to practice reading French on occasion!). But I have to disagree–you’re definitely no longer a neophyte! I know how you feel about falling behind re: reading mags! I have a huge stack on our coffee table–will get to them all ONE day (hmm, maybe our next house move??). And thank you so much for your sweet comment! It really means a lot. And I’m thrilled that your mom likes the “LaRaw” Bars!! Would love to hear what variations you’ve tried. Thanks so much for your comment! Glad you liked the recipe. I’m really looking forward to this roundup and all the healthy recipes! Thanks so much for your comment–it is much appreciated. 🙂 And glad you like the sound of the loaves. Do let me know how they turn out if you try them! I’ll be sure to tote some along next time we meet! If you like carrot cake w/ pineapple, this isn’t that different. I made these loaves a little less spicy than carrot cake, but you could always play around with the spices. I think these would be terrific for a road trip! I’m sure you could substitute other flour for the barley if you like; even all-purpose would work well, I’d guess, though you might have to adjust the amounts a bit. Yep, I forgot about the cookbook issue–I seem to keep buying them (perhaps even more, now that I’m blogging), though I know there’s no way I could really get through them all in this lifetime! Aw, Hannah, thanks so much–that really means a lot to me coming from someone who has inspired me so much this past year. And what’s this about “restaurant” baking–another venture?? Did I miss something on your blog?! What a great post! I too feel the same way about the blogging world. There are just so many great, sweet hearted, talented writers out there. I’m happy to be getting to know them. And that bread….ooghgh…that bread! I must make it now! Yeah, the blogging world is awesome. It really drives me to strive for perfection in my recipes and photography. It’s been great reading your blog, and the bread looks scrumptious. Ooo I’m always looking for healthy baked good recipes and your loaf looks so soft and delicious! I really need to try using avocado as an egg/fat replacer – such a great idea. I love the description of the loaf in the last paragraph. I was just thinking (as my co-worker eats a fatty non-vegan zucchini muffin from Starbucks) that I should use my left over zucc for a nice bran or wheat muffin. I also have a lot of pineapple… think I could shamelessly turn your loaves into muffs? Looks so filling and comforting… but your food always rocks my world. Hi Ricki, muffin tins, cool, that would be good! Because I love your food photos and they always make me drool, I have tagged you for a photo meme. I obviously need to stock up on avocados and start trying out your recipes. Pineapple loaves sound wonderful! Hi! Those muffins look tasty. I didn’t know you could use avocado in breads – doesn’t avocado get rancid when you heat it at too high of temperatures? Thanks! It’s fun to play around with different healthier replacements for ingredients. . . can’t wait to see what you come up with. Avocados are awesome! One of my very favorite foods. Let me know how you like the recipe if you do give it a try! Thanks so much for your comment, and for visiting my blog! I’d guess you could use avocado as an egg substitute and partial fat substitute in many things–I’ve used it in baked goods as well as savory recipes. Like olives, avocados are high in monounsaturated fats, which actually stand up quite well to heat (way better than polyunsaturates such as corn oil). Once it’s baked, it much less likely to go bad, in fact–just like cooked fruits or veggies, I’d imagine. I’ve made this recipe a few times now and have also frozen the loaves with no ill effects. Your mini loaves look delicious! I love the addition of avocado puree!! I LOVE making zucchini bread. I can’t tell you how many different recipes I’ve made of the stuff. I love it when the bread is dense and very moist. Great read.